generally navigate inside the Beltway. Essential to this work is maintaining a watchful eye, knowing what information is useful and where to find it, and communicating it to the client. Reporting need not be limited to the spare description of a particular issue or development. It can include details that fill in the story, identify key individuals and organizations, explain motivations, and describe the political environment. PHB Public Affairs provides clients with updates on a range of active topics in the Morning Matters eNewsletter as well as individualized reports that are tailored to a client’s particular interest. There may be such a thing as political science but the empirical method only gets one just so far when attempting to understand the underlying policy and explain decision-making in the political arena. One’s experiences and professional relationships accrued over years of working in the nation’s capital, in addition to a wealth of written resources—think tank studies, government reports, and testimony—are invaluable tools in public affairs work. PHB Public Affairs provides clients with the intentions of key actors, implications of proposed policy, and the insights that come with years of covering the port/maritime beat in the nation’s capital. The ways of Washington, D.C. can appear inscrutable to a visitor — lacking in logic and predictability, often downright mystifying. But like Pierre L’Enfant’s street design for the District of Columbia, there is rhyme and reason in how government is designed and functions. There is a political logic on Capitol Hill that is common to most legislatures. There is organization to the Executive Branch that can resemble corporate structures. The processes and procedures are easily learned. PHB Public Affairs has the experience that can provide useful guidance and a map to your objective. A client’s organization typically is trim, sometimes with limited resources, and focused on its primary mission. Those in-house resources often do not include the skills and experience that are valuable to government relations activity – the crafting of issue specific papers, testimony and grant proposals, the coordination of public relations with public affairs. A communications strategy at home and in Washington can be valuable in public affairs efforts. PHB Public Affairs brings to the task those and other skills; it is able to supplement and collaborate with the client’s in-house resources to produce an effective outreach strategy and finished communication products. It is a truism in Washington that an office holder prefers to hear directly from the constituent affected by pending regulation – someone who is a knowledgeable stakeholder and can best provide the real world ramifications of policy on a business or operation. A good public affairs advisor counsels the client to meet directly with the federal official whenever possible, but that is not always possible. PHB Public Affairs, a registered lobbyist, is on-site in Washington and always prepared to represent the client accurately and effectively. Morning Matters is prepared for clients and subscribers to highlight select matters of particular interest to the port/transport sector. It is driven by MTS related developments—not always in Washington, D.C. but almost always having something to do with Federal decision-making, policy thinking, and decision-makers. A frequently updated feature is a calendar of events pointing to activities of official Washington and in the MTS sectors. 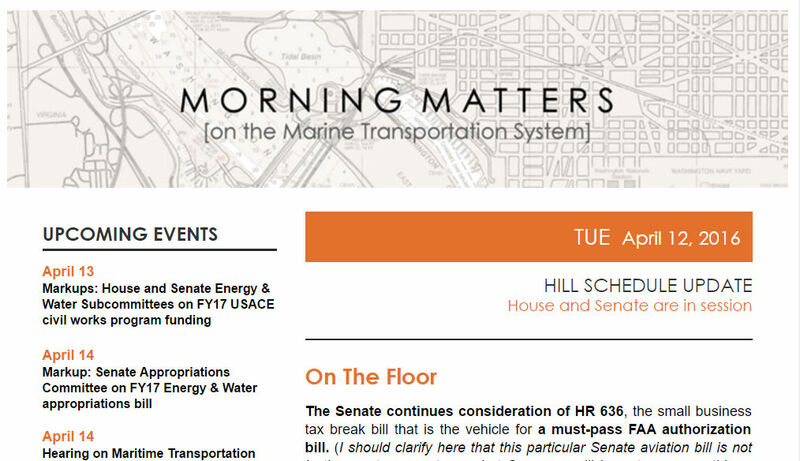 Morning Matters is suited for mobile devices and your desk screens and offers a convenient, quick means to stay informed. Interested in learning more? Tell me if you would like to receive sample issues of Morning Matters.